Here in Netmediablog I welcome you to the new month of June 2014, last month was an awesome month here and I published quite a good number of awesome articles and also got lots of great responses from you guys. Today I want to do a roundup of all the posts I published in May 2014 in case you missed anyone. I published 25 awesome articles in May; I bet you liked them because I always want to provide you with useful solutions and resourceful contents here. So let’s take a review of all the posts published in May once more. 2. How to Set Profile Picture on Telegram without Cropping: This article will show you how to set a full picture as your Telegram profile picture without cropping. 3. How to Set Animated Profile Picture on BBM for Android: Learn how to set animated picture as profile picture on BBM for Android app. 4. Difference between Jailbreaking, Rooting and Unlocking: Do you know what the difference is between Jailbreaking, rooting and unlocking? 5. How to enable 2-step authentication for YahooMail, Gmail and Outlook: If you don’t want anyone to have easy access to your email accounts or hack your account easily, then read this article. 6. How to add multiple contributors to one Twitter account: Do you wish you could add more contributors to your Twitter account? Then read this article to learn how to add multiple contributors to one Twitter account. 7. How to Spy on Theme and Plugins used in a WordPress Site: Do you want to find out what WordPress theme and plugins were used in any website? Then read this article to know what makes that website you jealous thick. 8. Mistakes most bloggers still make till today: It’s incredibly surprising that some bloggers still make these mistakes till date. Read this article and find out these mistakes and know if you are one of those still making them. 9. How to get people to share your posts on Social Media: Would you love to get more people to share your posts on Social media sites like Facebook, Twitter and Google+? Then find out the secret in this article. 10. How Custom Channels Can Improve Adsense Earnings: Do you know that providing advertisers with little more information can improve their biddings on your ad slots? Find out how you can create custom channels and placement targeting of ads on your website and improve your adsense earnings. 11. Top 5 Free Online Video Editing Tools: Check out these awesome free online video editing tools for your online video editing. 12. 7 Essential Security Considerations in Mobile App Development: Do you develop a mobile app? Then check out these 7 essential security considerations. 13. Moto E vs. Nokia X – Specification and Prices: This is a comparison of the device specifications of Motorola Moto E and Nokia X and the prices in the market. 14. How to deal with Family on Facebook – Ultimate Privacy Settings: Are you worried you can’t freely socialize on Facebook because of your family members? Then find out how to configure your privacy settings to determine what they see. 15. Netmediablog Android App now available on Play Store: Have you downloaded the Android app for my blog? Check it out here. 16. 5 Reasons why your blog needs an app right now: Are you a blogger? Find out five reasons why your blog needs an app now. 17. Customize your Website with SiteApps: Find out how you can add exciting new features to your site with siteapps. 18. How to Use Two Whatsapp apps in a Dual SIM Phone: Do you use a dual SIM Android phone and wish to have two different Whatsapp apps on your phone for the different numbers? Learn how to do that here. 19. How to Synchronize Google Calendar with Smartphone: You don’t have to miss that important meeting, anniversary or appointment just because you didn’t get a reminder. Learn how to synchronize Google Calendar to your smartphone now. 20. The World of eFax Explored! Learn all you could about eFax in this article and how to fax in this modern era using your email and printer. 21. 4 Ways to Reduce the Noise on your Twitter Feed: Learn how to weed away the unnecessary posts to flood your Twitter feed and see just the right posts on your Twitter feed. 22. All-in-One Desktop Specifications and Prices in Nigeria: Check out these awesome all-in-one desktop PCs and their prices in Nigeria. 23. What Most Web Hosting Companies Won’t Tell You: Unlimited is not always unlimited in web hosting, learn the ugly truth web hosting companies won’t tell you before you subscribe to their services. 24. Enterprise Cloud Deployment Failure – Who Is To Blame? Just as the headline, who is to blame for the enterprise cloud deployment failure? Find out here. 25. How to improve adsense earnings: Check out 5 awesome tips to improve your adsense earnings even without an increase in your web traffic. These were the articles published on Netmediablog in May 2014, I hope you find them interesting. Simply click on any of the titles to open the full article on a new window. This month will even be better, always visit Netmediablog for awesome contents like this. Wow, that’s interesting to hear, some only got 15 every month. Anyway, thanks for this roundup. Reading the list, I have to be honest, I’ve missed a couple on your list which is really interesting for me like seven and eight “Mistakes most bloggers still make till today” and “How to get people to share your posts on Social Media”. Of course, they are all interesting. Thanks for sharing, gonna give them a shot. :) Thanks! Thanks Metz for your awesome contribution, i hope to do even better this month. Watch out for the month of June. Thanks for sharing your last month article roundup with us. This really show how hardworking you are, most of us end up with 12-16 articles monthly and here you are rounding up 25 articles. All the 25 articles are worth of reading and educative. I have bookmarked this article post so as to come back and read them one after the other. I will urge you to kindly keep up the good writing . Hope to repeat same effort this JUNE. 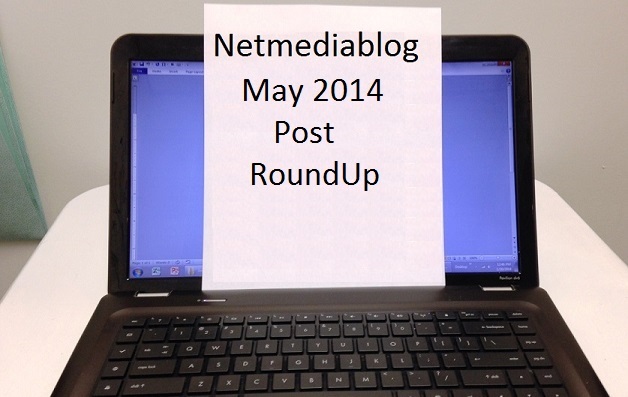 Its awesome to know that in the month of May 2014 you have shared 35 articles in NetMediaBlog! I have read some of them and they were very helpful. I like your style of “how-to” articles on technology based topics. These readily help readers that are Internet marketers to take better control of the tools they employ in trading. I have bookmarked this post and would check out those posts I have missed out already. Thanks for sharing! Great roundup, Nwosu! I happened to skip a couple of interesting articles right there. It’s good to have this list, definitely bookmarking these for future reference! Keep up the amazing work! gradually, you’re reaching your 2014 blogging GOALS…. you are doing great job..25 articles within 30 days is too good and all your articles are really useful articles. Will stay tuned to your blog for more updates. There were alot of really good topics that are on this list. Nice recap method too. Which Is the Best Smartwatch for Business?